When your one and only car model costs $1.3 million, you’re doing it right if you sell a dozen examples per year. At the recent Dubai International Motor Show 2011, Shelby Supercars did slightly better than that and got 10 signatures during the five-day show. That’s 10 times $1.3 million, or Dh4.8 million each. 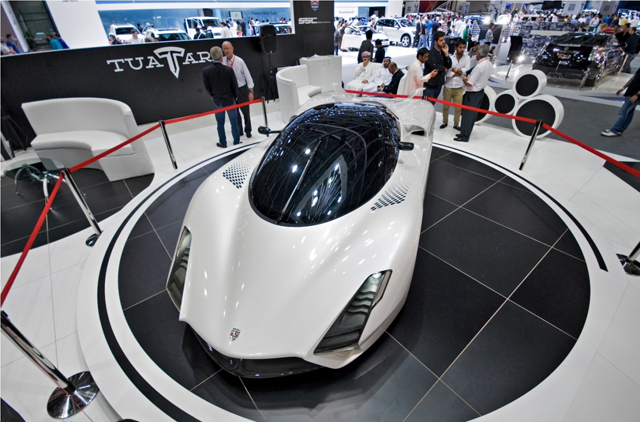 The record crowds at this year’s Dubai show were treated to dozens of regional debuts and even a global premiere from Chevrolet, but the millionaires’ toys attracted the most attention, such as the Lamborghini Aventador (which managed to find 14 new owners in five days), the De Macross GT1 and the hot-selling Tuatara. Now all the US hypercar manufacturer needs to do is produce some actual cars.